Mom's Gone Bronson! : #underwareness with Depend for Confidence, Elegance and Discreet Protection! #underwareness with Depend for Confidence, Elegance and Discreet Protection! Did you know that there are MORE people that suffer with bladder leakage that are in their twenties, than there are those in their eighties? That's one of just a few astounding facts that have encouraged Depend to bring forward its movement to to rid the stigma from bladder leakage so that everyone, young or old, that is suffering with it, can deal with it without having to let go of their dignity or pride! Depend enters its 3rd year of the #underwareness movement and encourage everyone to show support for the ladies living with bladder leakage, AND - for every photo/video shared using the hashtag #underwareness, featuring Depend products, Depend will donate $1 (up to $3 million), through 2016 to help support charities for research and education of bladder leakage! Depend provides an array of products. which can help you maintain your daily routine without the stress of the "what-if" and "why" of bladder leakage, with Silhouette Active Fit. NEW Depend Silhouette Active Fit briefs are of a moderate-absorbency with slim design for trusted protection and comfort that you expect from the Depend brand! Available in either black or beige colors, Depend Silhouette Active Fit has a lower rise and fit/feel like regular underwear, so you can feel confident and comfortable at the same time, all throughout the day! With more people at 50 or younger, than 60 or older suffering with bladder leakage, this is something we can all face, together and without the embarrassment of wearing the necessary protection to make your day that little more comfy! I have had 3 children and my insides will never be the same again. There are times when Depend would have been great for me in the months following the 3rd birth, when I needed a little bladder leakage protection, but my issues aren't as prevalent now as they have been in the past. I do have friends who swear by Depend and so I do know where to turn should my bladder decide to play games with me and I know where Depends can be found, with confidence! For free samples, you can visit Depend, HERE and check them out, gratis, today! 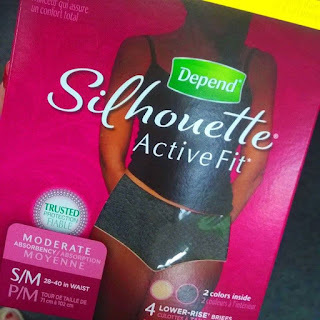 You might well see that the tide has turned and protection is nothing to be ashamed of now that Depend Silhouette Active Fit is here to stay! Be bold, be brave and stand up to your bladder issues and be the outgoing, confident, best version of yourself that you can be, now, with Depend's protection and don't forget to "drop your pants" for the #underwareness movement across social media, today!